The two singles I would like to share with you appear to be rather ordinary. But on closer study they are nothing of the sort. The first of these was given to me in the late 1980s by a brother of my ex-wife. I suppose he felt sorry for me after I had lost a huge pile of records travelling from Bamako via Moscow with Aeroflot (a trauma that haunts me until this very day...). 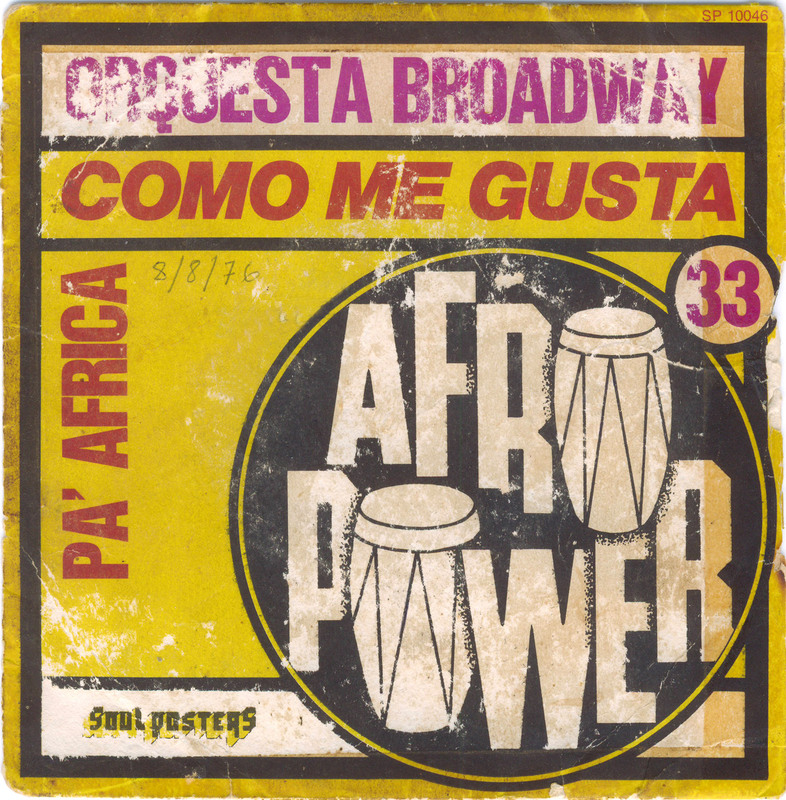 He gave me some singles, including a dramatically sanded down copy of "Whisky Magnin" by Amadou Balaké and this single by Orquesta Broadway. To be honest the quality of these singles was such that I didn't really listen to them, and they were soon lost in my archive. As often happens, they resurfaced after moving to our present home. But only recently have I been able to digitise the single by Broadway, and only then did I realise the 'rarity' of it. And I don't mean that the songs on the single are very rare or very special. They should be available either through some online service or through the album "Como Me Gusta". What makes this special is the combination of the B-side "Pa'Africa" with the place where this single was sold. For the single was bought - as can be seen on the back of the sleeve - in Ségou, Mali. 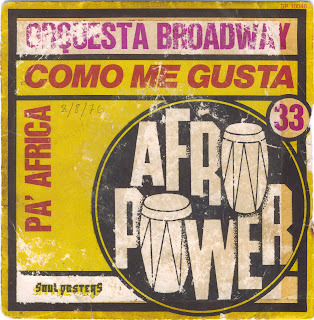 Several Malian musicians of the older generation have told me that Orquesta Broadway visited Mali in the early 1970s. I can find no record of this, only of their visits to Côte D'Ivoire (1973) and Senegal (1974) (more about their history here). But one way or another they had a huge impact on the Malian music scene. As far as I can ascertain these two songs were recorded before their visits to Africa, in 1972. This makes the insertions of the phrases in bambara even more remarkable. In perfect bambara after 1'44: "Let's go to Africa", and "let's go to sleep"(??). And this goes on till 2'24. As mentioned before, the quality of the vinyl is poor, and if you prefer listening to a cleaner version you can find "Pa'Africa" here or you can buy the A-side "Como Me Gusta" and the album with the same title in several online stores. 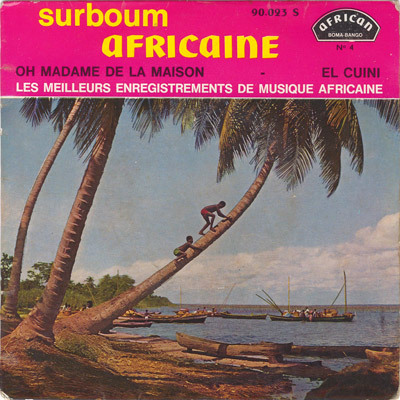 The second single of this post was also bought in Africa; to be precise in Gagnoa, Côte D'Ivoire. 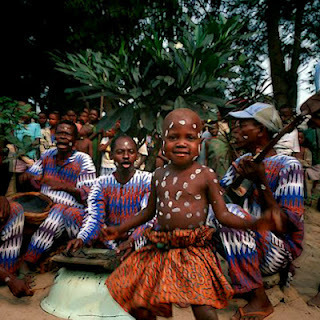 Again it is by an orchestra that toured West-Africa, although almost a decade earlier. Cuban maestro Enrique Jorrín (wikipedia and a much more detailed biografia in spanish, which shows the intricate web of connections between a great number of Cuban legends) apparently was inspired by the music he heard to such an extent that he actually decided to interpret a song, "Sute Monebo", which he labelled "Folklore guineo". This song has had me digging deep in my archives to find an original. An original, which I am sure I have heard at some point in the past, but have been so far unable to retrieve. 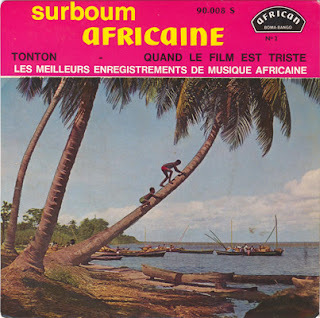 I have found versions by artists from neighbouring countries, like Ivorian Aïcha Koné (with her the title is "Soutemonebo") and by Malian Toumani Diabaté (Ketama), but these are from a much later date. Perhaps if you know of a version you can let us know. I'm almost certain that when I do find the missing original (or at least the older version I am sure I've heard), I'll go "oh, of course!". I can imagine that a lot of followers and fans of the music of Franco and his O.K. Jazz get confused about the chronology of this impressive oeuvre. Unfortunately the CD's that have been released in the decades since Franco's untimely death in 1989 have done little to take away this confusion. I admit, it is not easy to retrieve this chronology. And this is especially difficult in the recordings of the second half of the 1960s. In this period Franco was releasing records through different labels. The main labels were Epanza Makita (which according to Gary Stewart means "the rain that disperses gatherings", which should be a reference to the effect the recordings would have on the competition) and Boma Bango (which simply means "kill them"). 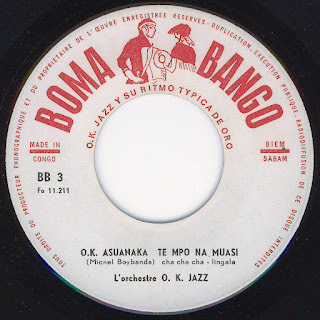 To complicate matters other orchestras, like Négro Succès (see for example this single) and Cercul Jazz, were also allowed to publish their songs via these labels. And to add to the confusion, O.K. Jazz songs were also published through the Likembe, the Tcheza and the Ngoma label. In a (perhaps futile) attempt to create a beginning of order, I would like to share with you the first four singles released on the Boma Bango label. I hasten to add that almost all of these eight songs have been released on lp or CD (and in some cases more than once). And the quality of these releases is certainly better than that of these scratchy old singles from 1966*. BB 2 is as typical of Vicky Longomba as BB 1 of Franco. 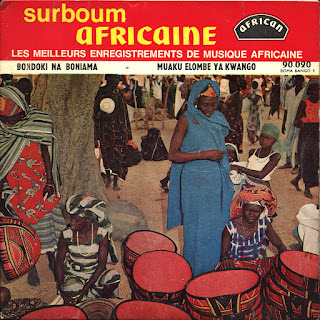 This single featured on "L'Afrique Danse", the first lp on the African label**, with songs released in 1966. It was later somewhat confusingly added, almost as an afterthought, to Sonodisc CD 36588. But both Vicky and Franco make the most of it (and I certainly prefer it to Ms. Vartan's version). Note, by the way, the trumpet in "Quand le film..". Does anyone have a clue as to the identity of this musician? 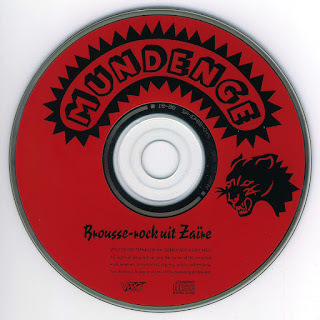 The third of these singles features two songs composed by Michel Boyibanda. Both of these were digitised for Sonodisc CD 36533, although the A-side "Ata Na Yebi" was renamed to "Valenta Yoka" and the B-side "OK Asuanaka Te Mpo Na Muasi" lost the "muasi" (= woman). The second, a cha cha cha, can certainly be characterised as a typical Boyibanda tune, if only because he had - at the time at least - a certain reputation for singing Cuban songs. But I am personally more inclined to favour the first, a very delicate rumba, with a fine balance of voices and a superb support by Franco, which lift the song to another level. Notable too is the lovely understated sax, probably by Verckys, but very much in the style of that master of saxes, Isaac Musekiwa. The fourth and final of these four singles contains two songs attributed to Verckys. Side A, "Oh Madame De La Maison", has a history for getting misplaced. It was included on the lp Authenticité Vol.3 (African 360.072), a collection of songs released in 1963 and 1964 on the CEFA label, and subsequently in digital form on Sonodisc CD 36586, a rather incomprehensible collection of songs from different labels and years. Besides this, the track is also interesting musically, and more particularly vocally. As far as I can distinguish Mujos is singing with Michel Boyibanda, but both are singing the lead part (so no lead and backing roles). This lack of harmony leads to a very tight song, which helps to accentuate Franco's neat guitar playing. Verckys hovers in the background for a long time, but when he finally does move to the foreground he does not challenge Franco (as he does for example in "Course Au Pouvoir" and other later tracks on the Boma Bango label). 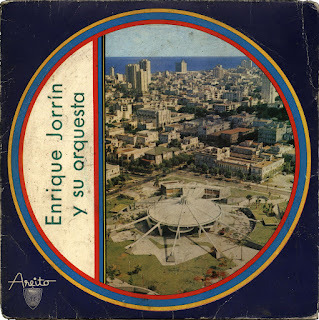 When I mentioned that both sides of this single are attributed to Verckys, I was referring to the B-side, "El Cuini". As far as I known this is a composition by Cuban legend Richard Egües and was made famous by his Orquesta Aragón (still going strong!). As with the other song which the O.K. Jazz borrowed from Aragón, "Chaleco", I am amazed at the idea of copying a song which relies heavily on the presence of a violin section and the flute of Egües. It must have taken quite a bit of inventiveness to 'translate' this to guitars and saxes, and just for this the O.K. Jazz deserve a credit. I particularly like the use of multiple saxes in this version, and I suppose this was Verckys' contribution. The combined four singles can also be downloaded here. And more Boma Bango tracks are on this lp I posted earlier. ** On this lp you can also find BB 5, "Finga Mama Munu"/ "Revolver" both by Mujos. A short post, to be followed by another one very soon. It is just that I have a craving for some solid vocals. 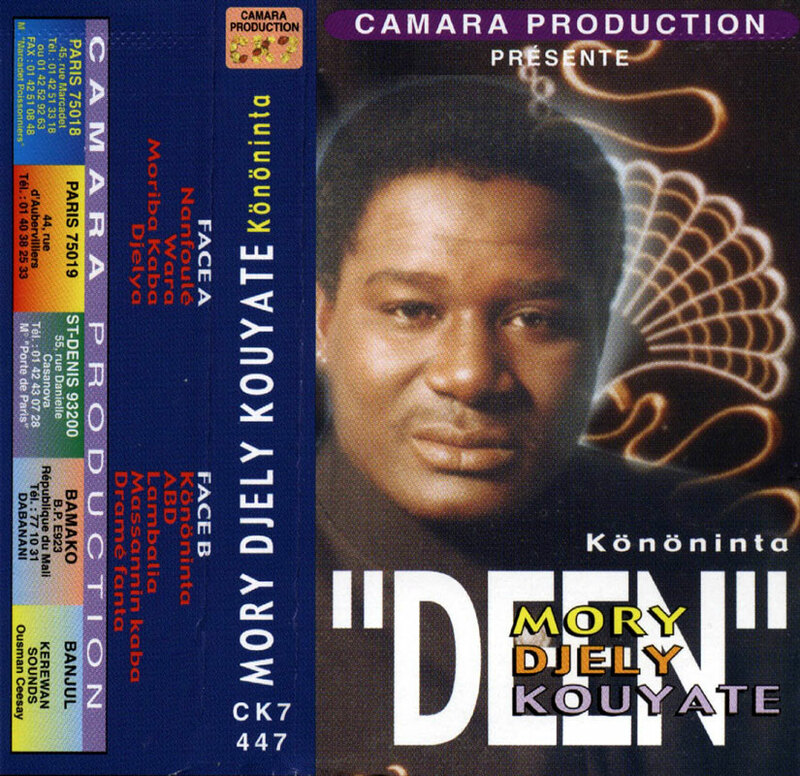 And in that respect Mory Djeli 'Deen' Kouyaté will always deliver. 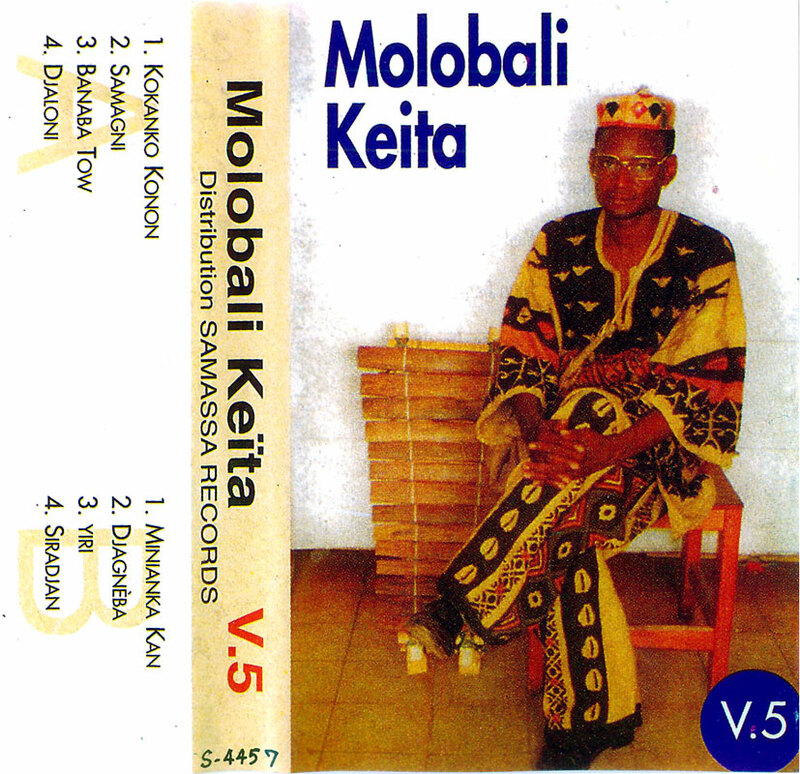 You may remember the cassettes and recordings of this star from Guinea I shared earlier (here and here). If so I am sure you also remember the weak spot in his cassettes: the accompagnement. And this cassette, which again appears to have been recorded in some Parisian studio, unfortunately has the same flaw. Despite the arrangements by Jean-Philippe Rykiel, Mory Djeli again manages to survive all the attempts to drown him in 'la mayonnaise musicale' originating from the interventions of Rykiel. Again, if you can mentally block out the superfluous synthesiser (and I know this is not easy! ), this cassette is quite enjoyable. 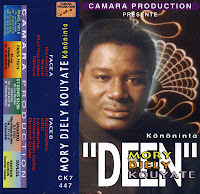 Mory Djeli is a great singer, but should - in my opinion - get rid of this Rykiel who is ruining perfectly good, classic songs like "Nanfoule" (yes another version), "Wara", "Moriba Kaba" (a notable victim of Rykiel destructive arrangements) and "Djeliya" (please don't compare this to Tata Bambo's version...). I have been very hesitant about posting this absolute marvel. Hesitant, mainly because of my appreciation for this masterpiece, and because of my high esteem for the genius who made these recordings. That I have persuaded myself to post it primarily has to do with the lack of recognition these recordings appear to be getting. And they certainly deserve to be honoured as a milestone in the publication of local and authentic music. Contributing to my posting has been the posting of other, earlier recordings made by the same Belgian musical explorer, Tony Van der Eecken, by my good friend Gerrit at Lola Vandaag. That cassette with recordings made in Burkina Faso should in itself be enough evidence of Tony's fine musical taste (I am particularly crazy about Les Trembleuses, those over the top bala players from Banfora). The recordings which Tony Van der Eecken made during trips to Congo (then Zaïre) in 1988 and 1990/1991 can be seen as a starting point for the '(re)discovery' of groups like Konono No.1 (see this earlier post). At the time of the first broadcast of these songs, on May 31, 1991 in a (four hours!) edition of VPRO's "De Wandelende Tak", they hit me right between the eyes. It was like the discovery of a missing link in the evolution of mankind. In retrospect this may sound somewhat exaggerated, but up to that point there had not been a lot of material from so-called folkloric music, which had NOT been recorded by (ethno-)musicologists. Besides, it was clear that this music was not some kind of static phenomenon, a culture frozen in time (and space), but a living music which incorporated influences both from traditional and modern styles. Listen for example to the opening track by the group SASA Tshokwe ("Sauvons l'Authenticité Suivant l'Art Tshokwe" - see also this site). The guitarist, a certain Mutshi, clearly is trying to do some Franco-like chords. Despite the use of what may be described as 'primitive' instruments (two cassette boxes, a bottle, a cooking pot) I certainly would not call the music primitive. Inventive, yes. Original, certainly. Even authentic and unique. The CD contains a fantastic and paradigm shifting collection of musical marvels. Songs that will move and will get even the most reluctant misanthrope moving. Who ever thought that it would be possible to dance to what sounds like a (mechanical) typewriter (track 3) or to the sound of someone blowing through a plastic tube into an oil drum (track 7)? As can be expected, the lyrics of the songs are as relevant as the music. Topics are usual of a social nature, like "eat together with others, for they will help you if you have a problem" or "those who drink a lot shouldn't forget they have a wife and children to feed" and similar globally valid themes. "The sun rises, everyone starts work, I am worried about my wife. [Chorus:] Where is my wife? I have woken up, everyone is at work, I stayed. Where is my wife? I agreed when she told me the other day: 'I am going to buy products on the market. Watch the house, I will come back. I am going to Kinshasa'. She died there, she did not return. I am worried, I remember her last words: 'Watch the house, I will come back, I promise'. I accept death, but my wife told me before she left 'See you later'. But she has gone (is dead). She has left clothes and shoes, but who is going to wear them? She has left the house full of money. I told her: 'Stay here, there is money'. But she replied: 'I have business to settle in Kinshasa'. [Chorus:] You have left me behind with many worries. What should I do? We shall tire them, we'll let them eat mushrooms (i.e. poison them). The young girls are numerous, we'll take them for free. You are numerous, we'll take you if you're not married. My wife, come, come, come. Come and eat beignets (i.e. the fritters which can be bought on any street corner). I have lost my wife. The family will hand out all the food I have ever eaten (during the funeral). When the beans were prepared (at the funeral), I wasn't there. Father Eugène, don't follow our music, go inside while we continue here. Sister Louise. don't follow this, prepare fufu for us to eat." Luckily these "Mundenge" recordings have proved to be only the start of a stream of memorable masterpieces. And in case you are wondering: yes, Tony Van der Eecken is a friend of Vincent Kenis. They travelled together through Congo. Vincent has subsequently introduced the world to Konono No.1, the Kasai Allstars and Staff Benda Bilili, besides being involved in a very interesting project to 'uncover' the remains of the Tango Ya Ba Wendo (1950s musical scene) in Kinshasa/Léopoldville*. Personally I am very impressed by The Karindula Sessions, which have been release as a CD plus a DVD. This video gives an impression of the mind boggling performances. The Karindula Sessions from Crammed Discs on Vimeo. For the past week and a half I have been living in a state of severe and toe-curling irritation. Of course the London Olympics came with the usual nationalistic sentiments, and with the customary hypocrisy with regards to the winners (of course no one begrudges those Chinese or US sportsmen and women winning all those medals). And I didn't even mind the hosts gloating excessively about their achievements. What really got me was "Team GB" (pronounced "Geebee"). It's like nails on a blackboard. "Team GB". They should shoot the idiot who started this. I realise the British have been 'matey' with the US for some decades now. The embarrassing encounters between Thatcher and Reagan immediately spring to mind. And I am aware of the uncomfortable and slightly bizarre relationship of Tony and George W (just thinking about this dynamic duo I get shivers running down my spine....). When it comes to cultural integrity, I am not as worried about Mali as I am about the UK. The country has survived colonialism with its culture intact. The islam in Mali is not the islam of Arabian Peninsula or the islam of the expatriates in Europe. What I have experienced of Malian islam suggests that the balance between islam and traditional culture is still in favour of the latter. So I am not convinced Mali will be an African Afghanistan. And evidence for this can be found in the music. There is so much authenticity in this music and such strength of culture. 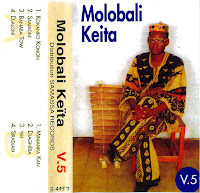 Listen , for example, to this cassette by Molobali Keita. This is volume 5, - and there are more (besides the ones I have already posted - Vol.4, Vol.3, Vol.2). No hint of "Team GB" there, don't you agree?